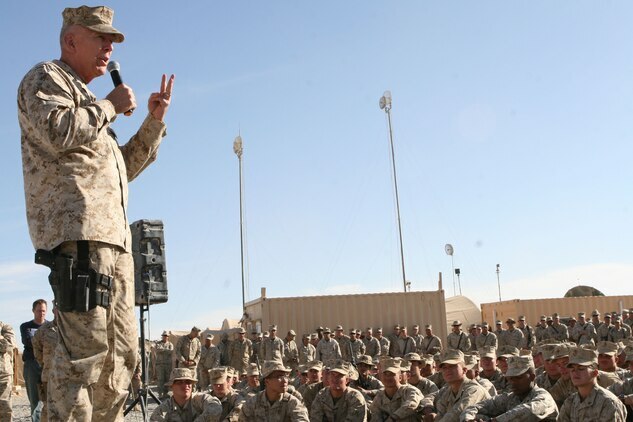 Gen. James T. Conway, commandant of the Marine Corps, talks to his Marines Nov. 26 about the future of the Marine Corps and the mission at hand in Helmand province, Afghanistan. Conway expressed his confidence in Marines getting the job done. When referring to operations in Afghanistan, “the sky’s the limit,”Conway conveyed in his Defense Department press briefing Dec. 15, even within an 18-month timeframe. Sgt. 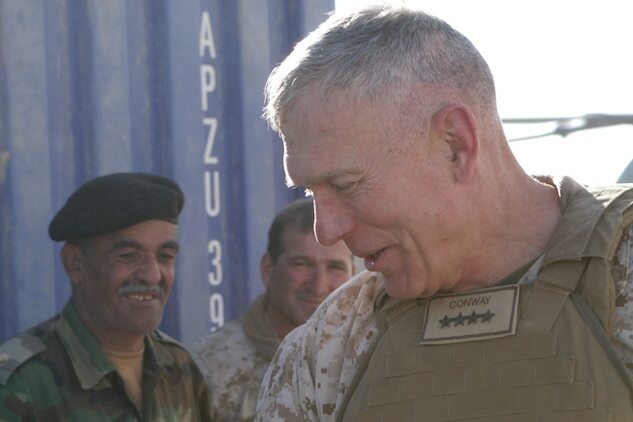 Maj. Carlton W. Kent, sergeant major of the Marine Corps, expresses his belief that the Marines in Afghanistan are continuing the Marine Corps legacy, Nov.26, in Helmand Province, Afghanistan. Kent also expressed his appreciation for the Marines hard work and sacrifice. Gen. James T. Conway, the commandant of the Marine Corps, greets the Marines of 2nd Battalion, 2nd Marine Regiment, during his visit to Forward Observation Base Delhi, in Garmsir, Afghanistan, Nov. 26, 2009. The commandant and Sgt. Maj. Carlton W. Kent, the sergeant major of the Marine Corps visited the Marines of 2/2 to talk about current changes and issues throughout the Marine Corps. Gen. James T. Conway, the commandant of the Marine Corps, is shown a map of 2nd Battalion, 2nd Marine Regiment?s area of operation by Lt. Col. John E. McDonough, the commanding officer of 2/2, during his visit at Forward Operating Base Delhi, in Helmand province, Afghanistan, Nov. 26, 2009. The commandant and Sgt. Maj. Carlton W. Kent, the sergeant major of the Marine Corps, visited the Marines of 2/2 to talk about current changes and issues throughout the Marine Corps. 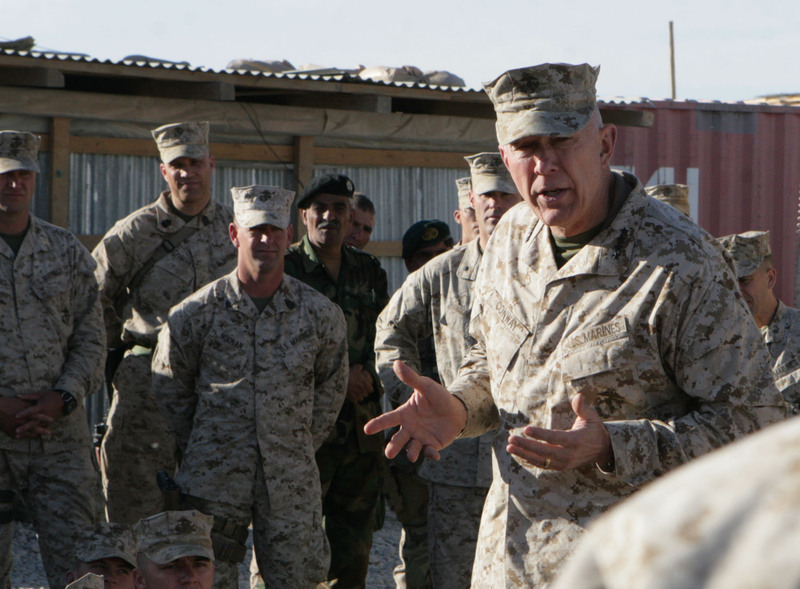 Gen. James T. Conway, the commandant of the Marine Corps, talks to the Marines of 2nd Battalion, 2nd Marine Regiment, during his visit to Forward Operating Base Delhi, in Helmand province, Afghanistan, Nov. 26, 2009. The commandant and Sgt. Maj. Carlton W. Kent, the sergeant major of the Marine Corps visited the Marines of 2/2 to talk about current changes and issues throughout the Marine Corps. HELMAND PROVINCE, Afghanistan -- The Marine Corps' top officer and senior enlisted leader addressed a myriad of issues affecting Marines throughout the Corps during their Thanksgiving visit to Marines and sailors currently deployed throughout Afghanistan's Helmand province Nov. 26. 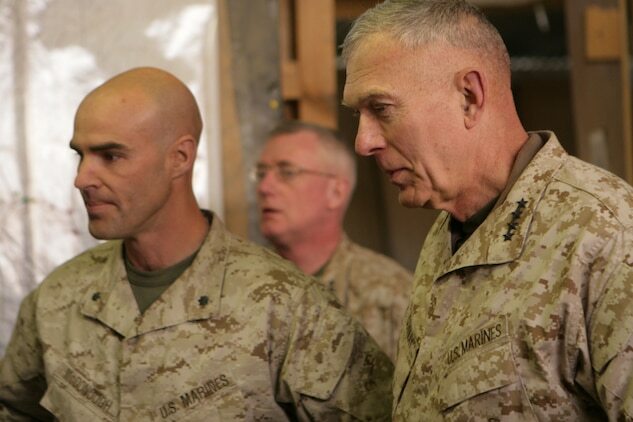 Gen. James T. Conway, the commandant of the Marine Corps, and Sgt. Maj. Carlton W. Kent, the sergeant major of the Marine Corps, visited 2nd Battalion, 2nd Marine Regiment, at Forward Observation Base Delhi, and the Marines of Regimental Combat Team 7 at Camp Dwyer. They addressed the possibilities of increased dwell time between deployments, the earlier than anticipated increase in the Corps? end strength, and a return to the Corps' amphibious roots. Marines deployed at the battalion level could very well be looking forward to a 2-1 deployment ratio, which will allow for seven months deployed and 14 months at home. "We think we can do that with the kind of numbers we're talking about here in Afghanistan, and we think we can do that for a long time," said Conway. Conway explained the increased dwell time will allow for more time for married Marines and their families, and the chance to start a family for the single Marines. Kent discussed the quick expansion of the Marine Corps, as its numbers increased from 175,000 Marines to more than 202,000. "The goal was to grow over a five-year period. It's a good news story that we grew in 2 1/2 years," he said. Conway addressed a necessary shift from the current land-warfare training, to the amphibious roots of the Marine Corps. "We've got to get back aboard ship," said Conway. "We've got to get back to the amphibious exercises so we understand the sophistication of something that is very difficult to execute." He also identified a needed increase in combined-arms exercises, which use to run about 10 times a year at Marine Corps Air-Ground Combat Center, Twentynine Palms, Calif., before Mojave Viper took its place. "The idea of any enemy, any place, any time, is a little bit hard right now, until we get some of those skills back. That's what we're going to attempt to do," said Conway. Conway and Kent thanked the Marines of 2/2 and RCT-7 for their hard work and contribution to the Corps' war fighting legacy, and addressed any questions from the Marines in attendance. "We are extremely proud of you," Kent told the Marines of 2/2. "You are war fighters, and we thank you for continuing the legacy of our corps." "The Corps is going to continue to be great because of these Marines. The legacy of the Marine Corps will never go away because these Marines carry the eagle, globe and anchor in their hearts," Kent said to the Marines at Camp Dwyer. 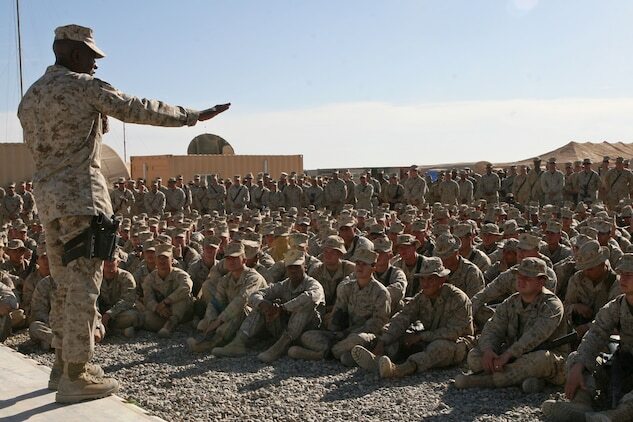 While thanking the Marines for their contributions already made, Conway informed the Marines of the challenges that lie ahead for the Marines throughout Afghanistan. "During your rotation here, there are going to be a couple of significant fights, a couple of places where the enemy has decided that he is going to create a hard knuckle along this river valley he's going to defend," Conway said. "Those (sites) are command and control, those are drug processing, those are training, those are logistic sites, and he's not going to leave those places easily. He's already got his defenses dug in right now in preparation of us coming to get him, but we have no choice. We are going to go get him." Conway harped on the necessity of turning over a secure and stable area to the Afghan national security force and the Government of the Islamic Republic of Afghanistan. "We're not going to stay here forever. This is about leaving a force that can maintain our accomplishments here," Conway said. Long after they left, their words left a lasting impression on many of the junior Marines. "It means a lot to me that he took the time to come out here, during war time, to our FOB and talk with us for a few minutes," said Lance Cpl. Lorenzo L. Smith, an embark specialist with Headquarters and Service Company, 2/2. "Their praise and confidence made me feel like we're getting things done," said Pvt. John A. Haringsma, a headquarters company clerk, for RCT-7. "When the commandant said he was confident we're going to get the job done, and Marines don't fail, it made me want to work harder, and I felt proud to be a Marine."